Castle Baths has wonderful natural spa products that will make your senses sing! I recently had the chance to try one of their baskets and I have to say that I am in love. 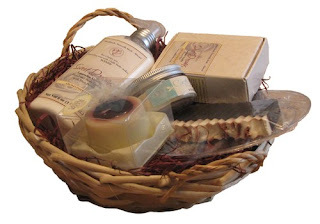 The Slice of Life Spa Gift Basket is filled with all sorts of dreamy goodies. Sweet Dreams Hand and Body Lotion, Cocoa Body Butter, an Italian Cake Candle, a bar of luxury soap and a phenomenal slice of fruit cake soap on a small plate all nestled in a wicker basket. The lotion comes with a hand pump to make disbursement easier. The Sweet Dreams scent is a lavender vanilla scent that will instantly relax you. The lotion is rich and creamy. It has a light scent and also has shea butter in it. When I first applied it, it was quickly absorbed into my skin. It isn't greasy either, just leaving me with moisturized, lightly scented skin. Divine! Just burn it on the side of the tub while you're being pampered with these wonderful spa products. It has a teasing, sweet scent that really sets the mood. The cake of soap lathers up really nicely and helps contribute to the whole spa experience. It's gentle on the skin and cleans well, with a light scent. By the time I was out of the bath, I was totally relaxed with the all natural products. Afterwards, I rubbed the cocoa butter into my skin for that all over indulgent feeling. I like to read, so of course I read all of the ingredients on every product. I was very happy to see that the cocoa butter was Fair Trade Organic Unrefined Cocoa Butter - definitely the best! By far my favorite in the basket is the slice of fruit cake slice soap. It's presented on a small plate , cut like a slice of cake and the scent is just amazing!! It's very colorful with all of the 'fruit' in it. 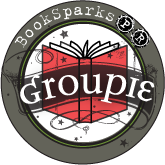 It can be used for decoration over the holidays in the kitchen or bath, or you can mail a slice to someone! If they don't like fruit cake, they will Love this one! Absolutely wonderful. All of the products in the basket are handmade and natural. 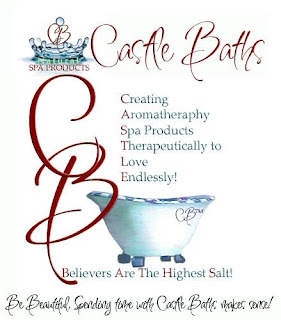 Pamper yourself or a loved with this holiday season and get them a spa basket from Castle Bath. The Slice of Life Spa Basket also comes with Chocolate Cake Soap instead of Fruit Cake as pictured below. One lucky reader will win a Slice of Life Spa Gift Basket! I think I would like the Avocado Eyes anti wrinkle eye cream. One of my favorite scents is rose, and I love body mists, I actually put some on before I go to bed every night so that there is a pleasant smell as I fall asleep, so the Bathsheba Rosewood Rose Natural Body Mist sounds great to me. Plus the idea of a body mist that is actually good for your skin is really appealing, I didn't know that existed. I love anything floral or fruity. Thanks for the great giveaway!!! I'd love to try the Sweet Dreams Hand and Body Lotion. Aww they have stuff for my cat! He could use some of their tear stain remover. I think I would like the coconut creme soap. I like Anna Designer Pet Extended DVD and Pet Shampoo Special. I have tried several times and the Raffle copter form will not load properly for me so I cannot enter :(. I would like to try the Restoration Dead Sea Salts. I also like the Fat Dog homemade soap. I would like to try the Tre'Yours Lavender Seaweed Dead Sea Salt Body Scrub. i would love the chocolate! Lavender Lovers Gift Basket is my favorite. I'd also like to try the CB Spa Bamboo Green Tea Foaming Exfoliator. I would like to try the Tre'Yours Dead Sea Mineral Mud Mask. I want to try the Lavender and Ylang Ylang Dead Sea Bath Salts! Id love to try the deep sea mud mask! I'd like the Large Trio- Anna Pet Tear Stain Remover. I like the CB Spa Bamboo Green Tea Foaming Exfoliator! Thank you for this amazing giveaway! I also liked the baby shower gift basket, the pet gift basket, the dead sea gift basket and the sweet dreams gift bag. They have so many products I want to try! Thank you for this great chance to win! Always chocolate, without a doubt.